What is a Factory Restore Drive? Every QuadStation system comes equipped with a very unique second hard drive called a Factory Restore Drive. Think of this extra hard drive like a safety net just in case something goes wrong. The FRD drive is completely bootable, so in the event of a hard drive or software issue you are covered. Simply connect the FRD drive to the primary position and your system will be restored back to factory state in minutes. During production, after all quality control inspections have passed and just before the system is prepared for shipping, the main hard drive is removed. A ‘clone’ is made of the main drive and copied over to a FRD drive, and mounted inside the system. The FRD remains disconnected for a good reason, to keep it pristine. This way, if you get a virus for example on the main drive, your FRD drive remains unaffected. Although copied by our rivals, Factory Restore Drives are a concept designed exclusively by NTI. Why include a second hard drive? QuadStation systems are designed with our customers in mind on every level, this is why we include the secondary drive. As with any computer system, when something goes wrong, 99% of the time it is software related (an application, the Windows OS, a virus etc), not the hard drive itself. When that happens it may be faster to switch over to the FRD drive rather than spending hours troubleshooting software issues. 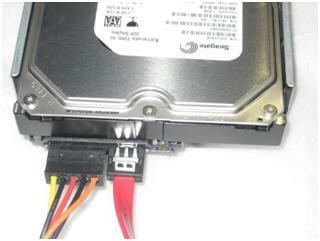 Although very rare it is possible that a hard drive can fail, but the FRD drive has you covered there as well. NTI understands that computer downtime is not an option. With this FRD drive you are back up and running with your system as it came from the factory in less than 10 minutes. No need to reload the operating system, component drivers etc, we have already done that for you saving you hours of time. Just reinstall your personal software and you are back to work. Once your system is back up in Windows, you can copy your data back over from your personal backup system (external hard drive, Carbonite etc) back to the new hard drive. Is this the fastest way to restore my system? Absolutely. If you compare the 10 minutes or so it will take you using the FRD recovery system to the several hours it will take you to reload everything from scratch, the answer is clear. Shut down the computer and remove at least the power cable from the back of the unit. ​Remove the left side cover of your computer case after removing the 2 screws on the back edge of the left side cover. Usually they are thumb screws (no tools needed) one high and one low. 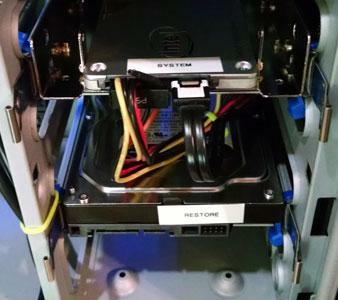 Locate the 2 hard drives mounted in your system. They would be labeled with white labels (SYSTEM and RESTORE or FRD). Note the pics above: Whether your main System drive is a Solid State drive or a full size hard drive the process is the same. Switch the two cables from the System drive over to the RESTORE / FRD Drive (see pic). Depending on the style of your case, the 2 cables shown in the picture should be easily accessible. For older systems the cables may be behind the drives requiring you to slide both of drives out of the hard drive trays. It is easy don’t worry. If this is the case you most likely will need to cut the zip ties on the sides, holding in the hard drive trays. We do this for the security during shipping. ​Restart your computer, the system should boot right back into Windows just as you bought it from us originally. Remember none of your data or programs that you have added after you bought the system will be there This procedure restores the system back to full factory state just as it came from us originally. Your data will still be on the SYSTEM drive that you disconnected. Read more below. You may be prompted to reactivate Windows is so follow the Microsoft prompts to RE-activate your Windows Operating System. Your product ID number will be on a sticker usually found on the side of your case. PLEASE NOTE. The Restore Drive is NOT a backup solution for your data. This special drive is not connected and used only for restoring a QuadStation system back to factory state as it came from the factory with Windows loaded. Please implement your own backup routine for backup up your data on a regular basis. Your system comes with the software to set this up, please refer to the software application help menu for instructions. ​If you have data that you need to move over from the original drive, contact our support team and we can tell you what to do next. Remember you cannot COPY back over any program. They will all have to be reinstalled, only data files can be copied. If for any reason you need to remove the hard drive from the case, this is easy. The hard drives are mounted in removable trays, so simply slide the tray out of the case by squeezing in the silver tabs on the left and right of the drive which will release the tray. Note that to ensure secure shipping these drives may have been zip tied on the sides, cut these zip ties before attempting to remove the drives. What about my main drive? After you change to the FRD at some point you will want to get back to the main drive which is a Solid State Drive (faster). So, if you had to switch to the Restore drive because of a virus, Windows or program corruption or hard drive failure (rare), you will want to reload Windows again on the SSD drive. You have everything you need to do that, the Windows install CD and all hardware drivers came with your system. DO NOT throw them away! This is best done over a weekend or a none work day. You would just disconnect from the RESTORE drive as shown above, and connect the SSD drive again. Change the 2 cables from the Restore Drive to the SSD drive as noted above. To begin Reloading a clean copy of Windows on the SSD drive, have the Windows operating system CD (that came with your system) ready and boot the system. As soon as you power it on, pop the CD in the drive. The system will begin to load Windows automatically on the SSD drive. If you have questions just give us a call, we will be happy to guide you. After Windows is fully reloaded on the SSD drive, you will need to install the Motherboard Drivers (this CD is in your accessories box), and the Video Card Drivers (downloaded). Contact us for the URL of the video card drivers as they vary. What is the difference in RAID and a Factory Restore Drive? Since 99% of computer system failures are software related, a RAID array would not help you in the event of any software corruption (a virus for example) it would just COPY the problem to the second drive. RAID only protects against a hard drive failure which is rare, but an FRD protects against hard drive OR software failure so you are covered no matter what. A very valuable feature that we offer at no charge, preventing system down time.